The JTV’s American Beauty Star Sweepstakes is open only to legal residents residing in the 50 United States and Washington D.C., who are 21 years of age or older. 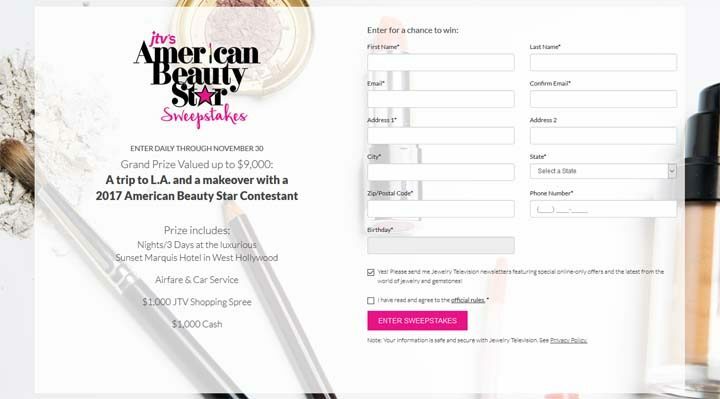 The JTV’s American Beauty Star Sweepstakes ends at 11:59 PM (ET) on November 30. During the sweepstakes period, visit pages.email.jtv.com/2017AmericanBeautyStar to complete the entry form. Limit one (1) entry per person per day. A trip to Los Angeles, CA for four nights and three days, consisting of: (1) airfare for two adults up to $1,600 total roundtrip from any city in the continental US and (2) hotel accommodations at the Sunset Marquis for two adults up to $1,800. Total Grand Prize Total Value: $9,079.